Cardiff's Craig Conway and Don Cowie struck in extra time to kill off Huddersfield's Carling Cup hopes. Gabor Gyepes and Jon Parkin headers put the hosts 2-0 up at the break. But Jordan Rhodes slipped the ball under Tom Heaton after skipper Paul Quinn's mistake and Danny Ward equalised with a low shot. Rhodes gave his side the lead, but Cowie levelled in added time before Conway and Cowie ensured a home win. Conway was the provider as Gyepes rose to meet his cross and Parkin was on the end of a whipped-in free kick for the second. But after the break Paul Quinn's mistake allowed Rhodes to score from close range. The Cardiff goalkeeper was then beaten by Ward, whose effort travelled through a forest of legs into the net. Rhodes struck after beating the offside trap to leave visiting fans believing their side were going to win. But Cowie levelled two minutes into injury time. The Bluebirds went back into the lead after Ward's run came to nothing and Whittingham sent Conway into free space with a long pass. Conway's shot took a deflection to beat Ian Bennett and Cowie drilled home the Bluebirds' fifth goal to send League One Huddersfield away with nothing other than their pride intact following a gutsy performance. 120:00+1:04 Extra time ends and the match is over. 119:41 Alan Lee has a header from deep inside the six-yard box and clears the crossbar. 116:50 Kenny Miller provided the assist for the goal. 116:50 GOAL - Don Cowie:Cardiff 5 - 3 Huddersfield Don Cowie finds the back of the net with a goal from outside the area to the bottom right corner of the goal. Cardiff 5-3 Huddersfield. 116:04 Kenny Miller takes a shot. Clearance made by Jack Hunt. 113:18 Shot by Rudy Gestede from deep inside the six-yard box clear the bar. 111:31 Jack Hunt takes the direct free kick. 111:31 Booking Darcy Blake booked for unsporting behaviour. 111:11 Free kick awarded for an unfair challenge on Alan Lee by Darcy Blake. 108:50 Andrew Taylor concedes a free kick for a foul on Alan Lee. Daniel Ward has a direct shot on goal from the free kick. 106:28 Corner taken left-footed by Gary Roberts, Jordan Rhodes takes a shot. Tom Heaton makes a save. 105:01 The second half of extra-time kicks-off. 105:00+0:21 Handball decision goes against Gary Roberts. Free kick taken by Tom Heaton. 105:00 Kenny Miller concedes a free kick for a foul on Jamie McCombe. Free kick taken by Ian Bennett. 103:20 Effort from inside the area by Kenny Miller hits the post. 101:22 Foul by Alan Lee on Gabor Gyepes, free kick awarded. Gabor Gyepes takes the direct free kick. 97:27 Don Cowie crosses the ball in from the free kick, save by Ian Bennett. 97:27 Booking The referee cautions Jack Hunt for unsporting behaviour. 97:20 Craig Conway fouled by Jack Hunt, the ref awards a free kick. 96:14 Unfair challenge on Alan Lee by Dekel Keinan results in a free kick. Free kick crossed right-footed by Gary Roberts from left channel, clearance made by Gabor Gyepes. 95:10 GOAL - Craig Conway:Cardiff 4 - 3 Huddersfield Craig Conway grabs a goal from just outside the area low into the middle of the goal. Cardiff 4-3 Huddersfield. 93:15 Tom Heaton takes the free kick. 93:15 Booking Alan Lee receives a yellow card for unsporting behaviour. 93:02 Craig Conway fouled by Tommy Miller, the ref awards a free kick. 92:16 Shot by Craig Conway from outside the box goes over the net. 91:39 Kenny Miller takes a shot. Save by Ian Bennett. 90:47 Craig Conway takes a shot. Save made by Ian Bennett. 90:00+4:12 The whistle goes for the end of normal time. 90:00+3:21 Free kick awarded for an unfair challenge on Alan Lee by Dekel Keinan. Direct free kick taken by Gary Roberts. 90:00+2:09 Assist by Craig Conway. 90:00+2:09 GOAL - Don Cowie:Cardiff 3 - 3 Huddersfield Don Cowie finds the net with a headed goal from close in. Cardiff 3-3 Huddersfield. 90:00+1:26 Unfair challenge on Don Cowie by Alan Lee results in a free kick. Don Cowie takes the direct free kick. 90:00+1:10 Short corner taken by Daniel Ward. 90:00+0:54 Daniel Ward takes a shot. Blocked by Andrew Taylor. 90:00+0:26 Alan Lee produces a right-footed shot from inside the area that clears the bar. 88:50 Strike comes in from Peter Whittingham from the free kick. 88:50 Booking Peter Clarke is cautioned by the ref for unsporting behaviour. 88:26 Foul by Peter Clarke on Rudy Gestede, free kick awarded. 87:22 Assist on the goal came from Oscar Gobern. 87:22 GOAL - Jordan Rhodes:Cardiff 2 - 3 Huddersfield Jordan Rhodes scores a goal from inside the penalty area to the bottom left corner of the goal. Cardiff 2-3 Huddersfield. 85:04 Substitution Andrew Taylor replaces Lee Naylor. 84:22 Gary Naysmith challenges Kenny Miller unfairly and gives away a free kick. Peter Whittingham takes the free kick. 82:07 Foul by Rudy Gestede on Jamie McCombe, free kick awarded. Ian Bennett takes the free kick. 81:32 Craig Conway takes a shot. Save made by Ian Bennett. 80:02 Substitution Joe Ralls leaves the field to be replaced by Peter Whittingham. 79:16 Free kick awarded for a foul by Dekel Keinan on Alan Lee. Tommy Miller delivers the ball from the free kick right-footed from right channel. 78:37 Effort on goal by Daniel Ward from outside the penalty box goes harmlessly over the bar. 76:04 Foul by Oscar Gobern on Joe Ralls, free kick awarded. The free kick is swung in left-footed by Lee Naylor. 75:02 Corner taken right-footed by Don Cowie, Dekel Keinan takes a shot. Save by Ian Bennett. 70:26 Effort from 18 yards by Alan Lee. Save by Tom Heaton. 69:12 GOAL - Daniel Ward:Cardiff 2 - 2 Huddersfield A goal is scored by Daniel Ward from inside the box to the bottom right corner of the goal. Cardiff 2-2 Huddersfield. 68:55 Daniel Ward takes a shot. Save by Tom Heaton. 67:35 Substitution Donal McDermott goes off and Gary Roberts comes on. 67:22 Shot by Daniel Ward from a long way out goes over the crossbar. 66:53 Effort on goal by Rudy Gestede from just inside the penalty box goes harmlessly over the target. 63:18 Substitution Kenny Miller is brought on as a substitute for Jon Parkin. 62:42 Free kick awarded for a foul by Jack Hunt on Don Cowie. Free kick taken by Lee Naylor. 62:21 Corner taken by Don Cowie, Jamie McCombe makes a clearance. 62:07 Jon Parkin takes a shot. Blocked by Gary Naysmith. 60:45 Craig Conway takes a shot. Clearance by Gary Naysmith. 60:08 Substitution Anton Robinson leaves the field to be replaced by Oscar Gobern. 58:24 Free kick awarded for a foul by Dekel Keinan on Jordan Rhodes. Free kick crossed right-footed by Tommy Miller from left channel, clearance made by Lee Naylor. 57:17 Darcy Blake takes a shot. Peter Clarke gets a block in. 55:17 Free kick awarded for an unfair challenge on Jon Parkin by Jamie McCombe. Tom Heaton restarts play with the free kick. 54:47 Free kick awarded for a foul by Dekel Keinan on Jordan Rhodes. Gary Naysmith takes the direct free kick. 52:55 GOAL - Jordan Rhodes:Cardiff 2 - 1 Huddersfield Jordan Rhodes finds the net with a goal from close range to the bottom right corner of the goal. Cardiff 2-1 Huddersfield. 50:19 Dekel Keinan gives away a free kick for an unfair challenge on Alan Lee. Free kick crossed right-footed by Tommy Miller from right channel, save made by Tom Heaton. 49:14 Inswinging corner taken from the right by-line by Daniel Ward, Tom Heaton makes a save. 45:48 Unfair challenge on Gabor Gyepes by Alan Lee results in a free kick. Tom Heaton takes the free kick. 45:06 Free kick awarded for an unfair challenge on Darcy Blake by Gary Naysmith. Free kick taken by Don Cowie. 45:00+2:03 The ref blows to end the first period. 44:56 Unfair challenge on Don Cowie by Daniel Ward results in a free kick. Dekel Keinan restarts play with the free kick. 43:52 Jon Parkin has an effort at goal from just outside the box which goes wide of the right-hand upright. 41:56 Inswinging corner taken from the right by-line by Daniel Ward, Gabor Gyepes manages to make a clearance. 41:38 Craig Conway takes a shot. Ian Bennett makes a save. 40:23 Craig Conway concedes a free kick for a foul on Jack Hunt. Jack Hunt restarts play with the free kick. 40:06 Inswinging corner taken left-footed by Daniel Ward, Gabor Gyepes makes a clearance. 39:18 Jordan Rhodes fouled by Darcy Blake, the ref awards a free kick. The free kick is delivered left-footed by Gary Naysmith from left channel, Jon Parkin makes a clearance. 37:46 Rudy Gestede produces a left-footed shot from inside the area that goes over the bar. 36:47 Foul by Rudy Gestede on Jamie McCombe, free kick awarded. Direct free kick taken by Ian Bennett. 36:25 Alan Lee gives away a free kick for an unfair challenge on Darcy Blake. Direct free kick taken by Paul Quinn. 35:49 Jon Parkin produces a right-footed shot from outside the penalty box and misses wide left of the target. 34:14 Alan Lee is ruled offside. Tom Heaton takes the indirect free kick. 33:37 The offside flag is raised against Jordan Rhodes. Gabor Gyepes takes the indirect free kick. 33:05 Foul by Jamie McCombe on Lee Naylor, free kick awarded. Direct free kick taken by Tom Heaton. 32:20 Unfair challenge on Jordan Rhodes by Dekel Keinan results in a free kick. Daniel Ward delivers the ball from the free kick left-footed from left wing, Darcy Blake makes a clearance. 29:38 Alan Lee gives away a free kick for an unfair challenge on Lee Naylor. Direct free kick taken by Tom Heaton. 29:05 Don Cowie takes a shot. Save by Ian Bennett. 28:04 Anton Robinson fouled by Darcy Blake, the ref awards a free kick. Peter Clarke restarts play with the free kick. 27:27 Foul by Alan Lee on Dekel Keinan, free kick awarded. Direct free kick taken by Tom Heaton. 26:26 Peter Clarke fouled by Rudy Gestede, the ref awards a free kick. Ian Bennett takes the direct free kick. 24:33 Tom Heaton restarts play with the free kick. 24:33 Substitution Lee Novak leaves the field to be replaced by Alan Lee. 24:33 Free kick awarded for an unfair challenge on Gabor Gyepes by Jordan Rhodes. 22:06 Lee Novak is caught offside. Tom Heaton takes the free kick. 20:26 Unfair challenge on Dekel Keinan by Lee Novak results in a free kick. Direct free kick taken by Tom Heaton. 19:03 Tommy Miller takes a shot. Tom Heaton makes a comfortable save. 18:38 Joe Ralls concedes a free kick for a foul on Anton Robinson. Tommy Miller takes the free kick. 16:54 The assist for the goal came from Craig Conway. 16:54 GOAL - Jon Parkin:Cardiff 2 - 0 Huddersfield Jon Parkin finds the back of the net with a headed goal from inside the penalty area. Cardiff 2-0 Huddersfield. 15:08 Assist by Craig Conway. 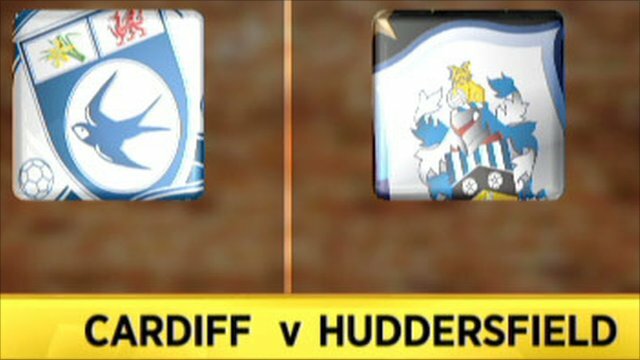 15:08 GOAL - Gabor Gyepes:Cardiff 1 - 0 Huddersfield Gabor Gyepes grabs a headed goal from inside the penalty box. Cardiff 1-0 Huddersfield. 11:36 Joe Ralls takes a shot. Save by Ian Bennett. 10:59 Rudy Gestede takes a shot. Comfortable save by Ian Bennett. 10:22 Donal McDermott takes a shot. Dekel Keinan gets a block in. 5:37 Foul by Jon Parkin on Peter Clarke, free kick awarded. Direct free kick taken by Jack Hunt. 4:39 Free kick awarded for an unfair challenge on Joe Ralls by Tommy Miller. Tom Heaton takes the free kick. 4:05 Jon Parkin concedes a free kick for a foul on Anton Robinson. Peter Clarke takes the direct free kick. 3:50 Foul by Jordan Rhodes on Dekel Keinan, free kick awarded. Direct free kick taken by Tom Heaton. 3:06 Corner taken left-footed by Daniel Ward from the right by-line to the near post, Don Cowie manages to make a clearance. 0:51 Joe Ralls fouled by Tommy Miller, the ref awards a free kick. Direct free kick taken by Dekel Keinan.